Before you ever start a project it is best to wind your yarn into a ball. This morning I had to ball all my yarns. It's a lot of work but it makes your project easier. How to Untangle Yarn: Is it Worth It? The first thing to consider when you have a tangled skein is whether or not it is even worth saving. Untangling yarn can take the better part of an afternoon and if you only paid $3.00 or $4.00 for the skein, your time is likely better spent scrapping it and moving on. This is particularly true if you knit or crochet as a business. If you are selling your wares, then it is not worth spending three hours untangling a skein of yarn that you can replace inexpensively. It will make your hourly income nosedive and will make a project that should take two hours end up taking five, and the purchase price of your item will not go up accordingly. Once you've done this once or twice, that adds up to several hours of labor for which you aren't getting paid. On the other hand, if you were planning to chat on the phone or watch a movie anyways, then mindlessly untangling yarn while you are participating in these activities is a way to keep your hands busy and save the money it would take to replace the skein. 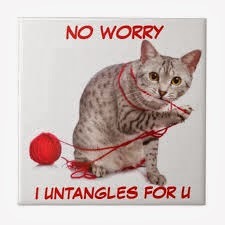 There is no quick, easy way to untangle yarn. Once it becomes a tangled mess, you can be sure that you will spend quite a bit of time partaking in the untangling process. If your yarn has become tangled simply from your skein flopping around while you are knitting or crocheting, then you can comfort yourself knowing that the yarn can be untangled. It has essentially wrapped around itself, generally in loops, and there should be no actual knots that cannot be undone. So, that's the bright side. If this is the case, then the best way to untangle the yarn is to patiently loosen the tangles as much as possible with a needle or your fingers and undo each tangled loop, slowly progressing towards a tangle-free skein. It is often helpful to find an end and work that single end back through the tangles one at a time. As you untangle the yarn wrap the now tangle-free yarn around a toilet paper tube, paper towel tube, piece of cardboard or even the back of a chair to keep the skein from tangling again. If your yarn has been tangled by a mischievous pet or child, then there might be actual knots and the process can be much more meticulous. If this is the case, then find an end and begin to wrap the tangle-free part as mentioned above. Loosen the tangles as much as possible and work the end through the knots as much as you can. When you reach a knot or tangle that cannot be manipulated, cut that section of the yarn out and tie the yarn together leaving a tail that is at least a couple of inches long. Continue to do this and to wrap the untangled yarn until you have a nice new ball to work with. So, you are in the middle of a project and your skein has gotten all wrapped around itself in tangles. If you don't feel like untangling it, you can continue your project by cutting the yarn you are using and starting a new skein. If you have another skein of the same yarn, this will work great for color and texture consistency. To start a new skein, cut a tail on the skein you are using that is at least six inches long. Then, either tie the new skein onto that tail (again leaving a long tail on the new yarn) and continue, or leave a long tail on the new skein of yarn and begin knitting or crocheting for about two rows. Then take the tail from the old skein and the tail from the new one and tie them together. Snip the tails after securing the knot, or weave them into your project. If you don't have another skein of the same yarn, or you want to get a bit creative, this is also a great time to take the opportunity to introduce a new color into your project. The best way to avoid spending hours untangling yarn is to prevent it from tangling in the first place. Sooner or later, you will likely still have to tackle some tangles, but you can limit this by trying one of the following methods. Use a yarn winder to turn your skeins into pull balls before beginning your project. Yarn winders can be purchased at your local fabric or craft store. Place your skein in a Ziploc bag with one of the bottom corners cut out to feed your yarn through. This will keep your yarn from flipping around on itself as much and also keeps it nice and tidy. Use a product like the Yarntainer to keep your yarn organized and tangle-free. The Yarntainer is basically a plastic cylinder (think pasta container) with a hole in the lid to feed the yarn through. Pull one end of your skein through an empty paper towel or toilet paper tube. Hold the tail down as you begin to wrap your yarn the tube at an angle. After a few rows, the forming ball will hold the tail down. Turn the tube periodically as you wind and you will see a ball begin to form. Once you have finished, pull the tail through the tube and take care to keep it from hiding in the middle of the ball as you take the finished ball of the tube. Cut a dowel into one foot lengths, then place one of the lengths in a power drill (like a bit). Tape one end of your yarn to the tip of the dowel farthest from the drill. Then, let the drill do the work of rewinding your skein onto the dowel. One note on this one - you will end up with your yarn very tightly wound around the dowel, it works fine, but I prefer a looser ball to work with. If you prefer to work with the skein as-is, it may help to use the end that comes from the center of the skein. When I use this method, I usually secure the outside tail to the skein with a paperclip or something of that nature so that it won't tangle up with the yarn as the skein flops around.